Abaxis made a five-year supply agreement with Banfield Pet Hospital. This agreement was to supply VetScan HM5 Hematology analyzers and sell the associated consumables to all Banfield Pet Hospitals. This agreement later emerged as revenue booster for the company. Medtronic plc. is aggressively focusing to expand its product offering through acquiring various companies such as Covidien and many more. These acquisitions have helped the company to grow and expand their presence throughout the world. The company is also looking forward to strengthen their presence through expanding their operational areas. A veterinary monitoring device can be used to monitor heart rate, respiratory rate, blood pressure, oxygen saturation, end tidal carbon dioxide and body temperature. These are mainly diagnostic devices used for the monitoring of various pet as well as wildlife animal population and have an increased demand in the North America region due to increased adoption of companion animals as well as increased pet healthcare spending across the region. The increasing superiority of monitoring devices in diagnostics as well as serial assessment is expected to propel the North America patient (veterinary) monitoring devices market with a CAGR of 4.5% over the forecast period 2018-2025. Increasing use of patient monitoring devices in careful monitoring during the recovery period to ensure the animal’s safety and comfort is expected to increase the market size of the North America veterinary monitoring devices to USD 189.22 Million by the end of 2025 from USD 115.38 Million in 2013. The demand for veterinary patient monitoring devices is increasing due to massive growth of healthcare industry across the region. Further, increasing awareness about animal health and ailments along with rising cases of animal diseases are anticipated to be the key growth drivers for the North America veterinary patient monitoring devices market over the forecast period. U.S. market for patient (veterinary) monitoring devices held the largest market during 2013 and is believed to cross 85% of the total market share by the end of 2025. The U.S. Patient (Veterinary) Monitoring Devices Market is further anticipated to grow significantly, whereas, Canada patient (veterinary) monitoring devices market will have a modest growth rate over the forecast period. 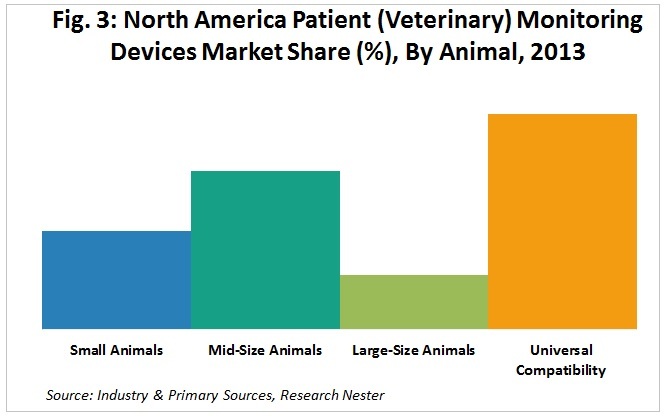 The North America patient (veterinary) monitoring devices market is divided by animals into small animals, mid-size animals, large-size animals and universal compatibility, out of which, the universal compatibility segment held the largest market share and is expected to grow with a significant CAGR over the forecast period. There is an increase in the trend of manufacturing veterinary devices that are compatible with animals of various sizes in the market as well as the accessories to work compatibly with these devices. 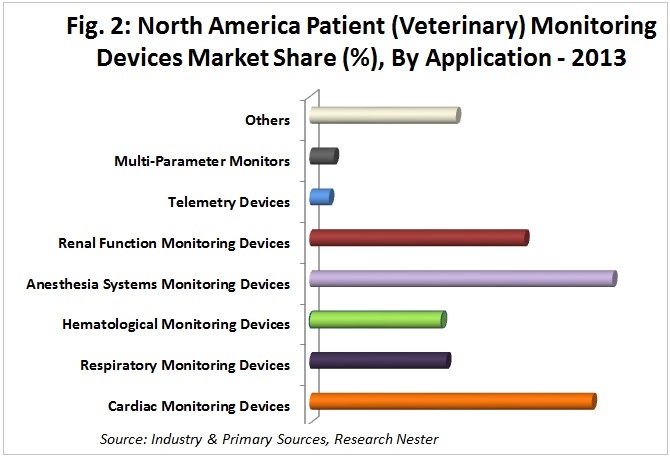 The North America patient (veterinary) monitoring devices market is segmented by configuration into portable, implantable and modular & compact. Among these segments, the modular & compact segment held more than half of the total market share during 2013 and is expected to achieve Y-o-Y growth rate of 4.8% in 2025. Further, the portable segment is believed to grow remarkably over the forecast period by expanding at a CAGR of 5.0%. The main reasons behind the robust increase in the demand for the portable veterinary patient monitoring devices are their light weight and their ease in moving. 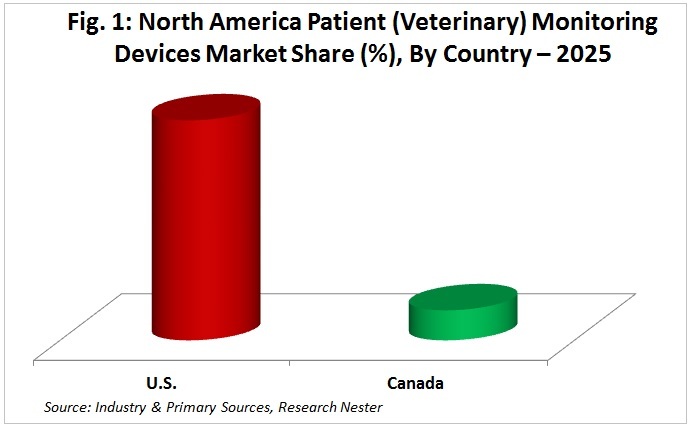 The North America patient (veterinary) monitoring devices market is divided by type into wired and wireless, out of which, the wireless segment held the dominant share of around 60% during 2013 and is believed to grow significantly over the forecast period owing the increasing preference of veterinarians towards wireless devices with lower installment costs. The North America patient (veterinary) monitoring devices market is segmented by end-users into veterinary hospitals, veterinary clinics and others. The veterinary hospitals segment is anticipated to be the most attractive segment across the globe in overall patient (veterinary) monitoring devices market for new entrants looking to enter in the market, existing players looking for business expansion and investors seeking investment opportunities over the forecast period 2018-2025. This can be attributed to the increase in the adoption of companion animals and growing rate of animal diseases in the region. Further, the veterinary clinics segment is expected to achieve Y-o-Y growth rate of 5.4% in 2025 owing to the growing number of the private veterinary clinics in the region. The North America patient (veterinary) monitoring devices market is thriving on the back of better diagnosis due to increasing technological superiority and serial assessment resulting in increased precision. The advances have not only led to better treatments but also faster and more accurate diagnosis as there are many new technologies that are giving veterinarians greater ability to diagnose and ultimately save ill animals. Increasing use of patient monitoring devices in chronic disease management and careful monitoring during the recovery period to ensure the animal’s safety and comfort is expected to increase the value of the veterinary monitoring devices in upcoming years. Further, the non-requirement of pre-market approval for veterinary monitoring devices as well as exemption for post-marketing reporting is anticipated to increase the demand for veterinary patient monitoring devices in upcoming years. The various cost constraints associated with the veterinary monitoring devices are anticipated to affect the veterinary patient monitoring devices negatively over the forecast period. Some of the affluent industry leaders in the North America patient (veterinary) monitoring devices market are Smith’s Medical, Bionet America Inc., Mindray, Welch Allyn, Midmark, Abaxis, Digicare Biomedical, DRE Veterinary Equipment, Grady Medical and HiggsB Medical. Moreover, other key and niche manufacturers are constantly working with research institutions, healthcare facilities etc. along with the in-house R&D resources to understand the technology gap and patient demands and address these requirements with innovative products. These could be self-funded or done under government initiatives. Further, the manufacturing companies are taking up various initiatives in order to expand their consumer base. This could involve consumer awareness, branding and advertisement, local outreach programs etc. or have tie-ups with the active distributors.